Heart diseases are one of the biggest killers in the world. The main reason behind heart problems and high cholesterol is the lack of attention paid to what we eat. We will through this article, therefore, try to unravel the super foods that lower cholesterol. Different foods lower cholesterol in different ways. Some deliver soluble fiber, that binds cholesterol and its precursors in the digestive system and drags them out of the body before they get into circulation. Some give you polyunsaturated fats, that directly lower LDL levels. And, some contain plant sterols and stanols, which block the body from absorbing cholesterol. The harmful LDL rises and the HDL decreases essentially because of one’s dietary habits and other lifestyle-related choices. Genes play a vital role too — some people are genetically programmed to respond more dynamically to what they consume. Below are the ways in which cholesterol can be maintained through a naturally healthy heart diet. Intake of foods that lower LDL levels, i.e., the harmful cholesterol-containing element that causes artery-clogging atherosclerosis, should not be consumed. Furthermore, one must reduce intake of foods that boost LDL. Therefore a balance is essential. Below mentioned are 10 super foods that lower cholesterol levels and reduce other risk factors causing common heart diseases. 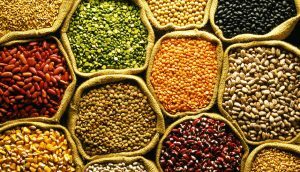 Pulses are also commonly known as legumes. These comprise of plant foods that include lentils, chickpeas, alfalfa and beans. These high sources of protein, fiber and minerals while being low in fat are one of the healthiest foods to lower cholesterol.By including refined grains and legumes in our diet we can help lower LDL cholesterol levels and reduce our risk of several heart diseases. An added benefit of consuming pulses is that it helps you lose weight and promotes good overall health. Studies claim that eating half a cup of pulses a day effectively reduces LDL levels by an average of 6.6 mg/dl. Worried about what to eat or what foods to lower cholesterol? Don’t think twice before eating avocados. Avocados are a great source of nutrients, monounsaturated fats and fibre. The latter two nutrients are responsible for lowering LDL cholesterol levels and triglycerides and raising healthy HDL levels. Therefore, avocados are a must to include in the list of foods that lower cholesterol in India. Nuts are another exceptional source of healthy nutrient-rich food. Amongst all kinds of nuts, almonds and walnuts hold the highest rank in the foods to lower cholesterol in India due to their high monounsaturated fat, protein and mineral content. Moreover, firstly, nut, in general, are rich in the plant variety of omega-3 fatty acids (a type of polyunsaturated fat) which promote a healthy heart and health. Secondly, they are high in L-arginine nutrient (amino acid that helps to make nitric oxide) which helps to regulate blood pressure. 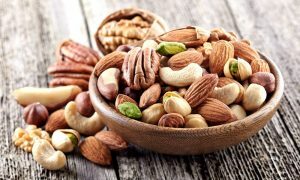 And lastly, nuts contain phytosterols (plant compound), calcium, magnesium and potassium that play a major role in reducing cholesterol LDL and blood pressure levels. Research has proven that consuming nuts daily decreases the risk of heart diseases by a whopping 30%. 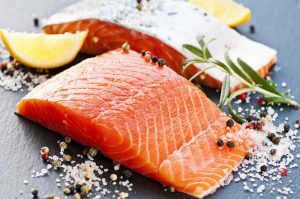 Fatty fish, such as mackerel, tuna and salmon are high in omega 3 fatty acids making them an excellent food source to lower cholesterol. Fish helps to balance cholesterol levels by increasing HDL cholesterol level in the body and the omega-3 fatty acids lower LDL levels and triglycerides in the bloodstream promoting a healthy heart. When you consume fish, make sure you eat it by either baking, broiling, grilling it or having it raw. On the other hand, consuming fried fish may cause the opposite effect, i.e. increase your LDL levels and heighten your chances of heart diseases. Whole grains help to lower the risk of heart disease by reducing cholesterol levels. Whole grains contain vitamins, minerals and soluble fiber, making them an excellent food to lower cholesterol. All grains are good for your heart, but the two that stand out are oats and barley. Oats and barley contain beta-glucan fiber that helps lower cholesterol. 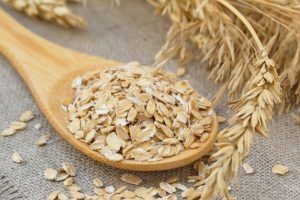 Besides, studies claim that on consumption of oats, one reduces the total cholesterol and LDL cholesterol level by 5 % and 7% respectively. Cocoa is the main ingredient in dark chocolates. Having dark chocolate and cocoa as foods that lower cholesterol may seem too good to be true. 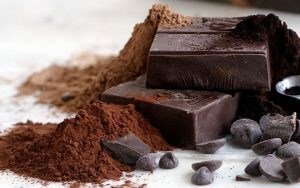 But this claim is backed by research that flavonoids in dark chocolate and cocoa effectively lower LDL cholesterol levels, blood pressure and raise HDL levels. They also work towards safeguarding the LDL levels in your blood from oxidation that helps to promote a healthier heart. But, do remember dark chocolate and cocoa are a double-edged sword. If you consume too much of them they may negatively affect your heart health since they are extremely high in added sugar contents. Therefore, to avoid this danger of the elements backfiring, either consume in moderation or use cocoa directly or choose dark chocolate with cocoa content higher than 80%. 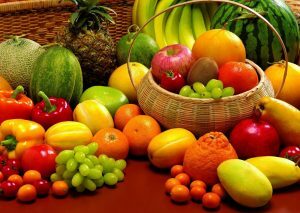 Fruits are a great source of all things healthy on a diet. Fruits such as apples, grapes, strawberries and citrus fruits are a high source of antioxidants and soluble fiber ( eg., pectin is believed to lower the LDL levels by upto 10%) that work towards lowering cholesterol levels. Fruits and berries are a rich source of plant-based protein compounds that lower bad cholesterol levels ( LDL ) and increase good cholesterol levels ( HDL ) Another reason to add fruits to your diet is that they contain bioactive compounds that help to lessen the chances of contracting heart diseases. As far as vegetables are concerned, they are an exceptional food to lower cholesterol in India by forming a crucial part of every Indian’s diet. Vegetables are not only rich in fibers, antioxidants and plant-based compounds, but are also low in calories. Vegetables such as okra, carrots, potatoes and brinjal have high contents of pectin, i.e. the same soluble fiber found in apples and grapes. All these prevent the onset of abnormal heart rhythm or other heart ailments in general. 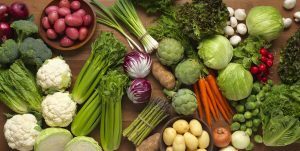 While all vegetables are beneficial for your heart, dark leafy green vegetables such as spinach and kale are particularly helpful as they contain lutein and other carotenoids, which are linked to a lower risk of heart diseases such as atherosclerosis. These veges bind themselves to the bile acids and make the body secrete more cholesterol thereby helping to lower cholesterol levels in the body. Dark leafy greens are also beneficial for your eyes, wonder how? Find out in: Which Foods are Good for Eyes Article. Soy is a good food to lower cholesterol. It reduces LDL and total cholesterol while increasing HDL cholesterol. The effect of soy food in terms of cholesterol reduction seems to be the most effective on people with very high levels of cholesterol. 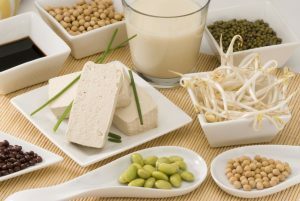 Eating soy foods, soya desserts, soy meat alternatives and byproducts of soy such as tofu or soya milk, etc are a beneficial way to lower cholesterol and promote weight loss and thereby a healthy heart and body. Studies have confirmed that including as little as 15g of soya in your diet can lower your cholesterol level by around 6%. To maintain low cholesterol, it is crucial to keep the saturated fat intake below 20g and 30g for women and men respectively. 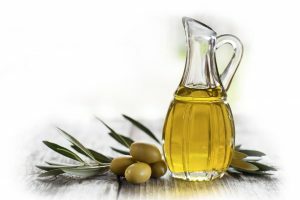 Furthermore, what’s important is to replace this saturated fat with modest amounts of unsaturated fats such as those found in olive, sunflower, corn and other vegetables, nut and seed oils. Therefore, extra virgin olive oil is an excellent food to lower cholesterol. 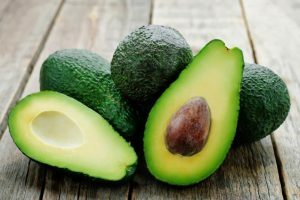 It is a rich source of monounsaturated fatty acids and antioxidants that raise HDL “good” cholesterol levels and lower LDL “bad” cholesterol. Another added benefit is that it is also rich in polyphenols which may reduce the inflammation triggering heart ailments. One should, therefore, strive to avoid butter, lard and use olive oil instead. Tea: Rich source of plant compounds along with Catechins ( help to generate nitric oxide which is helpful for balanced blood pressure) and Quercetin ( help to improve blood vessel function and lower inflammation) altogether work towards lowering total cholesterol and LDL levels. Foods Fortified with sterols and stanols: These two compounds are an additive to foods such as margarine, granola bars and orange juice. They are extracted from plant gum contributing towards absorbing cholesterol from food. An intake of 1.5-2.4g plant sterols every day has been shown to reduce cholesterol by 7-10% within 3 weeks. Having high cholesterol levels can hamper your heart health and make you more vulnerable to heart ailments in general. However, you can substantially lower your risk by eating and avoiding certain foods that lower cholesterol. The 10 foods in this article will help you stay healthy all year long. Always remember to maintain a balance while consuming foods to lower cholesterol in India. Make sure you consume several foods that lower cholesterol levels rather than merely one, as putting your eggs in two different baskets ought to work more effectively. Focus more on what you put in your shopping basket the next time you go to the market and change your eating habit. This is the most natural way to lower cholesterol levels and reduce your risk of heart ailments. By providing constant care to your cholesterol level by consuming food items like nuts, grains, pulses, fruits and vegetables which will keep your blood pressure under control besides keeping your arteries, bones and digestive system healthy and responsive for overall well-being. Here’s a list of the best Cardiologist in India.